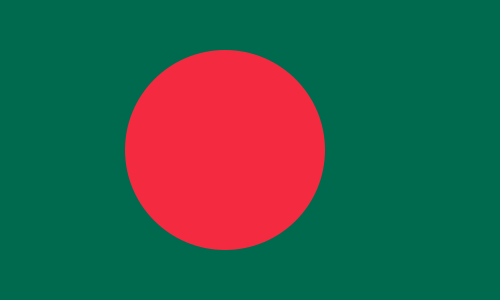 Adopted on January 17, 1972 as the national flag of Bangladesh. It's almost identical to the one used during the Liberation War in 1971, except that a yellow outline of the nation of Bangladesh that had been placed in the center of the disc was removed- they reckon the difficulties of rendering the map correctly on both sides of the flag. What's unusual and somewhat striking about this flag is that the red disk is slightly off-center- they also wanted to avoid any use of the Crescent and Star symbol seen on the flag of Pakistan, because well, let's just say that the events leading up to the Liberation War and the independence of Bangladesh weren't exactly fun and pleasant. The first version of the flag was designed and made by a section of student leaders and activists of Swadheen Bangla Nucleus on 6 June 1970, at room 108 of Iqbal Hall (now Sergeant Zahurul Haq hall), Dhaka University;students involved with the design were namely Kazi Aref Ahmed, ASM Abdur Rab, Shahjahan Siraj, Manirul Islam (Marshal Moni), Swapan Kumar Choudhury, Quamrul Alam Khan (Khasru), Hasanul Haq Inu, Yousuf Salahuddin Ahmed and few others. The flag was made from clothes donated by Bazlur Rahman Lasker, the owner of Apollo Tailors, Dhaka New Market. A map of East Pakistan (now Bangladesh) was first traced on a tracing paper from at atlas by Hasanul Haq Inu, Yousuf Salahuddin Ahmed and Enamul Haq, at Enamul's room (312) in Quaid-I Azam Hall (now Titumil Hall), EPUET. Later the map was painted in the red circle by Shib Narayan Das. On 2 March 1971, this initial version of the flag was hoisted in Bangladesh for the first time at Dhaka University, by student leader A. S. M. Abdur Rab, the then Vice President of Dhaka University Students' Union (DUCSU). Okay, let's break this down a bit. Let's go ahead and say that even though I got this 'graph right out of Wikipedia, it's all true. If so, how crazy is this? I mean, the know the origin story of their flag right down to the room numbers and which dorms people did what in and when it was first flown over Dhaka University. Meanwhile, in America, our university students are more concerned about safe spaces, trigger warnings and micro-aggressions. Makes you think, doesn't it? This flag has an origin story that's worthy of any superhero out there and that's kind of cool, at least to me, because well, I'm a flag nerd. The symbolism is simple though: the green stands for the lushness of the land of Bangladesh, while the red stands for the sun rising over Bengal and also the blood of those who died for the independence of Bangladesh. Until next time, keep your flags flying- FREAK or otherwise!